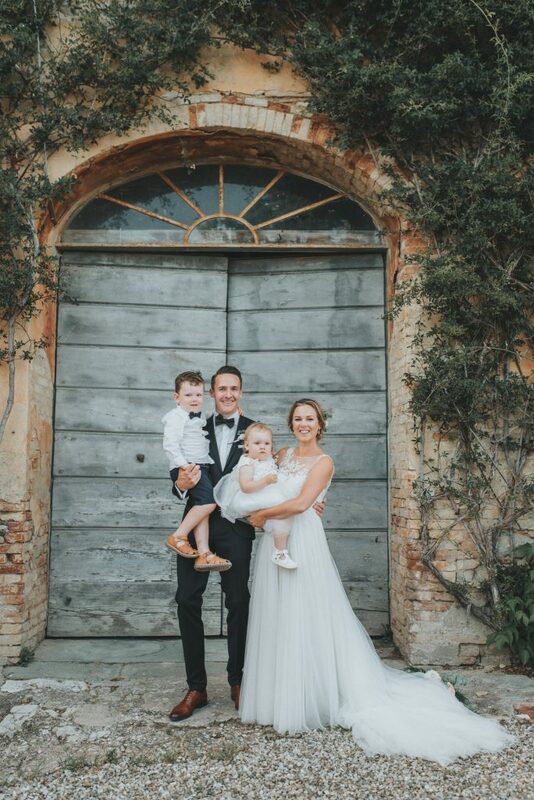 This wedding took place in a country villa near Siena. The lovely couple come from Sweden and they contacted me a year and a half before the wedding date, so we had plenty of time to plan everything in the best detail! 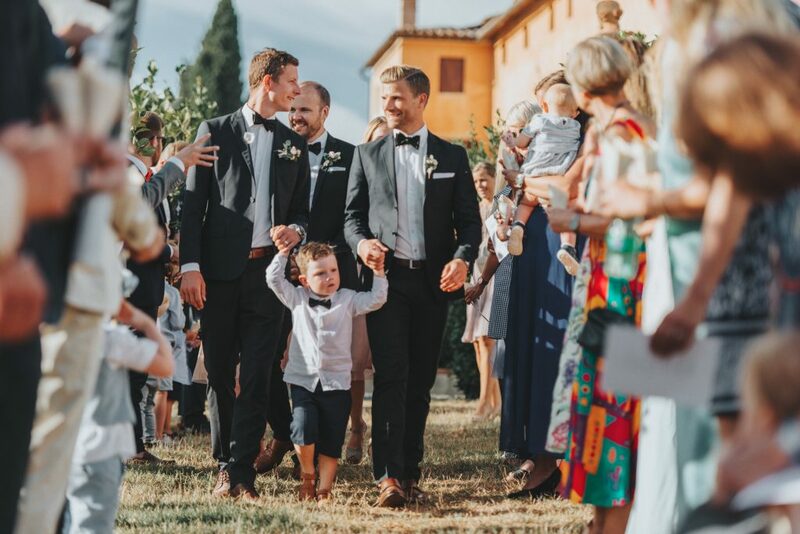 Their whole family came over for the wedding, so it was a big family affair with lots of children and friends – they outnumbered the family! Anna Karin wanted a mystic feel to her wedding but with an elegant and sophisticated feel to it so they decided to have the tables decorated with long garlands of greenery and roses. It was beautiful and very elegant, despite the weather we have had this summer – even before the ceremony it was raining a bit. We are always prepared with a Plan B though and so we covered the tables and at luckily in the end they could have their ceremony under the Tuscan sun and then had their white wedding dinner surrounded by their many friends and touching speeches in the courtyard of the Villa before the party started. 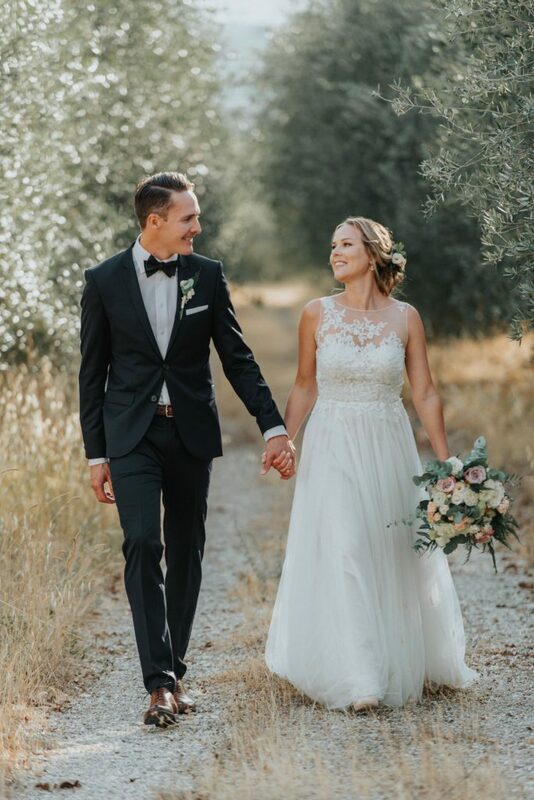 I knew when I first contacted Hewelin that she was most definitely the right person to select to help make our wedding arrangements – I had written her an email and she responded in a way that showed she’d listened (read) what it was we needed help with and the costs involved. We liked that she was clear with what was required from us and what she would do. 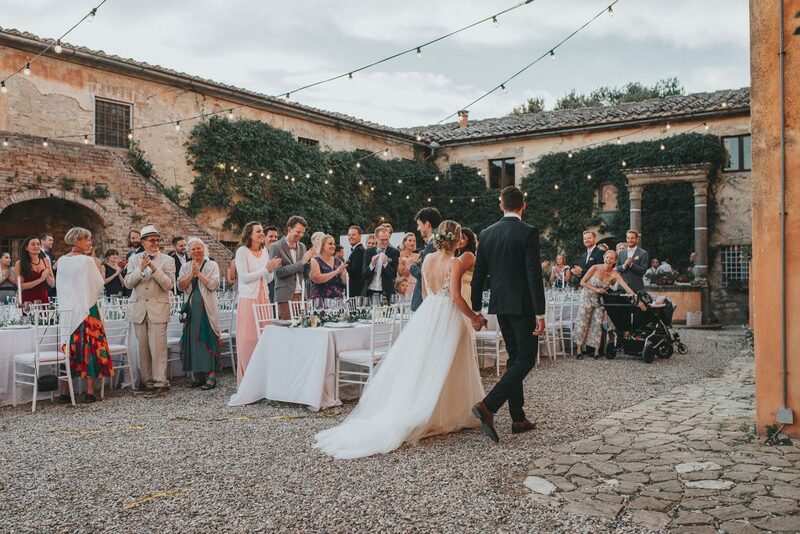 We never actually spoke to her until we arrived a year on in Tuscany but she was always available throughout the process on email and even WhatsApp, and she’s just as wonderful in person! 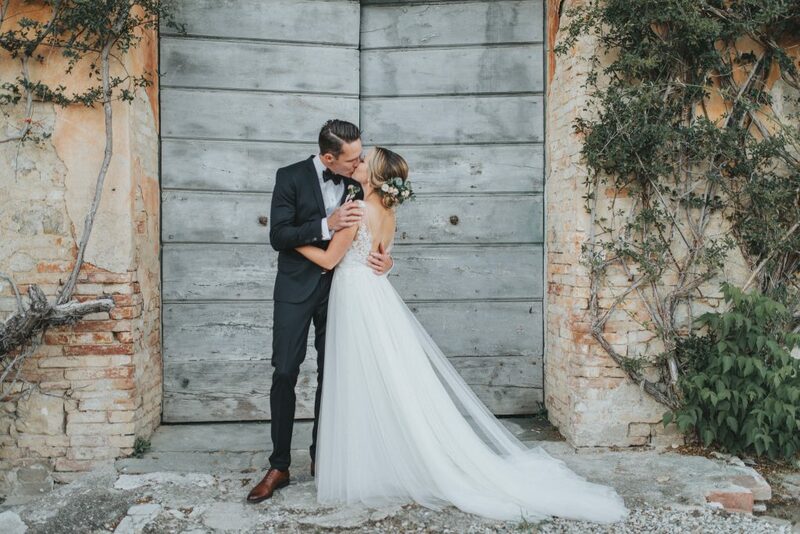 We required her services for arranging the legal ceremony and translation only but we were considered just as important as I imagine all her brides and grooms regardless of what services she provides. Nothing was too much trouble and she went above and beyond to ensure our magical day went smoothly. 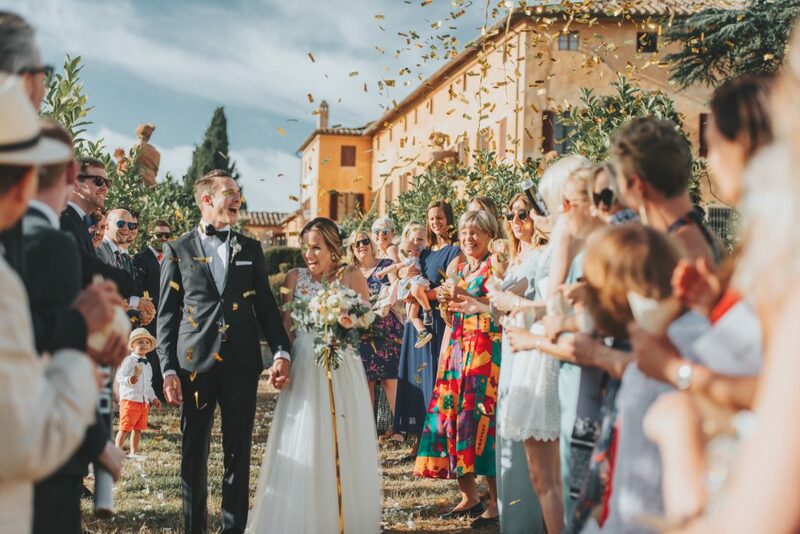 Hewelin made organising our Tuscan wedding stress free and I highly recommend anyone wishing to marry in Tuscany (which in my opinion, everyone should, because it’s so very spectacular) to contact Hewelin.